Monday Nitro – Scotts Blog of Doom! I…didn’t know that was possible. Things are looking very, very down for WCW as they roll into the new millennium. With all of the insanity flying around, it certainly seems that all hope is lost for the company, but that has never stopped any wrestling promotion before. This time around though, it’s not about flying off a cliff but rather crashing down onto the rocks below and seeing how much more damage can possibly be done. As it turns out, it’s quite a bit actually. 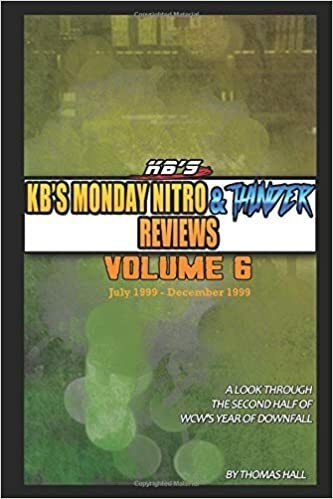 In this book, I’ll be looking at Monday Nitro and Thunder from January – June 2000 and try to see just how bad everything was able to get. The shows were a nightmare but somehow it kept getting worse every single week. Each episode will be broken down match by match and segment by segment. Included will be analysis and ratings for the shows to see why the year is remembered so poorly. The book runs about 385 pages and is available on Amazon both in a physical paperback for $10.99 or an e-book format for $2.99. In case you don’t have a Kindle, there are plenty of FREE apps you can get from Amazon for pretty much any electronic device, all of which are available at this link. Or if you’re in another country with its own Amazon page, just search “KB Nitro VII” and it should be the first thing to come up. A comprehensive look back at every episode of WCW Monday Nitro and Thunder from July – December 1999. This is a rather bad time for WCW as everything is starting to fall apart due to a combination of horribly boring wrestling and some rather questionable booking choices. With the good old boys no longer doing the trick, the solution was to bring in the star of WWF Creative: Vince Russo, meaning it’s all downhill from there. In this book, every episode of both shows in the second half of 1999 is reviewed in full, complete with analysis, ratings and complete content included. The book is available on Amazon both in a physical paperback for $10.99 or an e-book format for $2.99. In case you don’t have a Kindle, there are plenty of FREE apps you can get from Amazon for pretty much any electronic device, all of which are available at this link. You can pick up the book from Amazon here. From the UK Amazon here. From the Canadian Amazon here. Or if you’re in another country with its own Amazon page, just search “KB Nitro VI” and it should be the first thing to come up. Also you can still get any of my previous books on the WWE Championship, the Intercontinental Championship, Monday Night Raw from 1997, 1998, 2001 and the first half of 2014, Monday Nitro from 1995-1998, In Your House, Summerslam, Starrcade, ECW Pay Per Views, Royal Rumble, Saturday Night’s Main Event, the WWF and WCW pay per views from 1998, Wrestlemania, WWE Grab Bag and Clash of the Champions at my author’s page here. –Jim Ross narrates a video package that puts over Adam Bomb and Jean-Pierre LaFitte, announcing that both men will face each other on today’s show. –Ross and Stan Lane are doing commentary and they are kicking off a new set of tapings in Johnstown, Pennsylvania. The tapings were done on June 7 and according to historyofwwe.com they drew 2,000 fans. A comprehensive look back at every episode of WCW Monday Nitro and Thunder from January – June 1999. WCW is in trouble and there’s not much of a better way to put it. They’re being defeated by Monday Night Raw in the Monday Night Wars, but as any wrestling historian can tell you, that doesn’t mean there’s no hope. Monday Night Raw was crushed for the better part of two years so maybe WCW can come back as well. In this book, every episode of both shows in the first half of 1999 is reviewed in full, complete with analysis, ratings and complete content included. Normally this will be selling for $3.99 but for the next ten days (as in thru Sunday November 27) it’s going to be at a sale price of $2.99. Pick it up cheap while you can! In case you don’t have a Kindle, there are plenty of FREE apps you can get from Amazon for pretty much any electronic device, all of which are available at this link. Or if you’re in another country with its own Amazon page, just search “KB Nitro V” and it should be the first thing to come up. Also you can still get any of my previous books on a ton of wrestling topics here. It’s the go home show for SuperBrawl and it’s probably not a good sign that they’re in Mississippi for the second week in a row. We’re set for the pay per view and the card isn’t exactly thrilling but you can see how we got there for the most part, which is a lot better than some of the shenanigans we’ve put up with from WCW over the years. Let’s get to it. It’s always weird to me when we reach the last every episode in a given month but this is the final ever episode of Monday Nitro in January. Ok so maybe this is just a way to fill in an opening because there isn’t much to talk about at the moment other than Nash vs. Steiner coming up in a few weeks. Let’s get to it. Starrcade is rapidly approaching and WCW is clearly on its (final) last legs. We’re building towards a double main event of Goldberg vs. Lex Luger II and Scott Steiner vs. Sid for the World Title. If you need a better reason than that to explain why WCW is in the shape it’s in, you haven’t been paying close enough attention. Let’s get to it.